Welcome to the Securicore UK eLearning Platform. This induction is designed to provide you with the essential information you will need in order to carry out your duties properly. The Induction will take 00 - 00 Hours/Minutes. From the main menu you will see a number of sections, each with relevant content about the site and what is needed from you. Simply click the start button on each section, and work from top to bottom. After clicking start, read the information carefully, taking notes where you feel necessary. For each page, follow the instructions to proceed to the next page. There is a navigation menu that will show page page you are on and how many pages there are in total. once you have read the information within a subject, there will be a multiple choice test to assess your knowledge. Don't worry, if you get something wrong, you can go back at correct it. Once you have completed a Section, you will be returned Home to continue with the remaining sections. From the home screen you will notice that your overall progress will update. Once you have completed all sections and are happy with your progress, click the Submit Results button. We will then assess the induction prior to deployment. Your progress will be saved automatically, and will not be submitted to our office for approval until you click the Submit Results button on the Home Screen. You can complete this induction all at once, or break it down into bite size chunks by clicking the "Take a Break" button at the top of the Page. When you have finished reading this page, click the home button to return to the main menu. You can return to this or any page at any time. 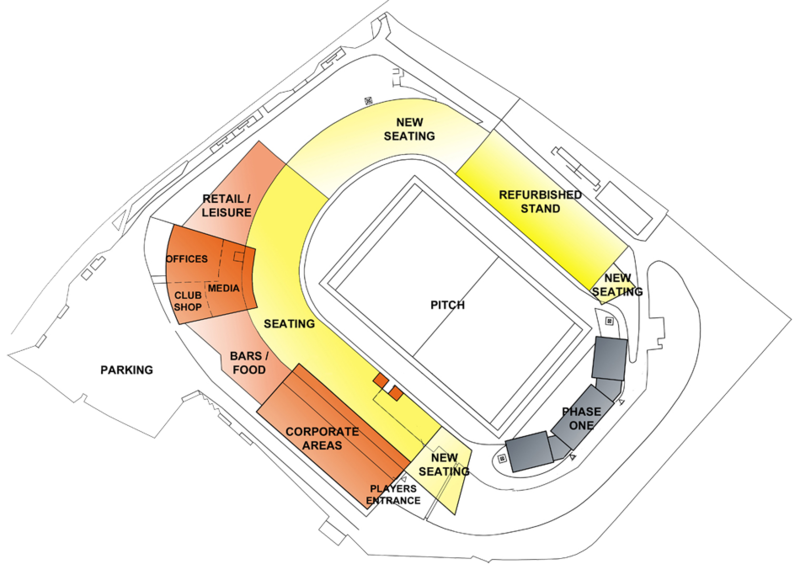 The Bradford Bulls Site requires Security Guards to man the site out of normal opening hours. New Security Guards are expected to attend a one off Site Familiarisation Session lasting up to 1 hour before their first shift. This means you must attend 1 hour prior to your schedule shift time. All guards must perform a 20 minute handover when a guard starts each and every shift in line with Shift Handover as described later in this induction. Here we have an arial blueprint of the site. The Entire site has 60+ points that must be covered during the initial lockdown of the site, these will be detailed within your Site Familiarisation. Our primary role is to prevent unauthorised access and Secure the Grounds. Monitoring the Site Signing In process. Locking down the site and opening up as per Site Familiarisation. Activate and Monitor Alarms where applicable. Perform Regular patrols (Hourly is Advised). Reporting all incidents, occurrences and hazards as per the site Security Logbook. In the event of an incident where you need assistance or advice in order to carry out your duties, a contact sheet is provided within the Assignment Instructions in the site Security Logbook. You may need to contact site staff or Securicore UK in the event of and incident, occurrence or emergency procedures. It is important to read the Security Logbook thoroughly, paying special attention to the Assignment Instructions. This may answer many questions in advance. The security officer will be based from the Security Office whilst not on duty. There are facilities in this location for the Guard, including a warm dry base, toilets and a kitchen with microwave & kettle. With the last 12 months there have been three break ins at the site, from which we have identified Weak spots where access is gained and Hot Spots which are being targeted. Areas of the site to be aware of as they are more susceptible to exploit. Fence line between overspill gates: Fence has been bent out of shape allowing for easier access. Pedestrian Gate: Large gap under the gate. The uniform required for this site is Black and Whites as defined in your Company Induction. Black Shoes or Boots & Dark Socks. Your uniform must comply with our company policy. It is advised you are familiar with this, as your uniform will be assessed as part of our internal audits. You must provide and maintain your own uniform. You must wear the company branded PPE at all times. Indoors this can be worn over your uniform, outdoors (weather dependant) this should be work over your Hi-Vis Coat. PPE is deemed part of your uniform, and is owned by Securicore UK. These too will be assessed as part of our Internal Audit Inspections. Coats and Vests are stored in the Security Office. Fully Charged high beam Torch with Spare Battery & Charger. Any Food or mediation required throughout your shift. Any other items deemed as necessary in order to carry out your duties. A high beam torch is provide by the client in the Security Officer, however it is advisable to carry a spare in case of it not being available or faulty/discharged. Details of any events happening during your shift, so as to have an indication of who to expect. Anyone arriving at the site unexpected must be confronted and verified. Identify the location of any persons that remain onsite and there expected departure. Ensure the site remains secure whilst there is sill staff/visitors onsite. Question whether there were any incidents that have happened on site throughout the prior shift, this may give you vital insight and intelligence into potential incidents through your shift. This information may be vital if you are needed to liaise with a third party i.e Emergency Services, Securicore UK Officers etc. Ask if there is anything else you may need to know in respect to the duties and responsibilities your are required to perform. It maybe that there aren't any, but you must ensure open communication is maintained so you know when to open the site, any contractors that may require access or any other Special Instruction that would not be part of your normal duties. All visitors and staff are required to sign in and out of the site. This includes the duty Security Officer(s) and/or representatives of Securicore UK. Securicore UK staff MUST also sign in on the Security Logbook. It is the responsibility of the guard to ensure this happens unless advised otherwise. If advised otherwise, this is to be noted in the Occurrence Log. The Signing in register in located in the entrance to the Security Office. The key safe(s) are located within the Security Office. You will be given details of which keys are required in order to carry out your duties. There are a number of keys for various parts of the site, you will be required to note which keys are need by whom, when and where. This information will be provided on you Site Familiarisation Induction. Once completing the shift handover, the first task is to lock down the site immediately, considering and instruction given to you during the Shift Handover. It is important when locking facilities to ensure the premises are empty, and must remain sterile whilst you conduct your sweep, so that person(s) cannot enter areas you have already checked, thus trapping them in the building. Ensure to turn lights off as you sweep each area, noting any instances that may need to be noted in the Occurrence Log, for example a window that may be locked in the open position. Securicore UK have an agreed patrol route with the client, which is detailed further in this induction. It is a part of our contract that each area is checked and locked in the order provided. A full site patrol should be conducted immediately after the Lockdown. This may vary from day to day, dependant on the events held onsite. This will be communicated to you at the Site Familiarisation. Lock down can be conducted in a vehicle, car must be given and site speed restrictions must be adhered to. The opening Procedure will vary dependant on the Day and any events to be held. Monday - Friday: Unlock Yellow Gate and Gate 4 at 05:30 for the arrival of the Next shift. The day shift will open the remainder of the ground. Saturday: Unlock Yellow Gate, Gate 4 and Pedestrian Gate at 09:00 for the shop. Sunday: Unlock Yellow and Gate 4 OR Pedestrian Gate for the Shift change. This will vary dependant on how the next guard will arrive. We are awaiting instruction from the client on the operation and instruction in respect to site CCTV System. We are awaiting further details from the Client on the location and operation of the Alarm Systems. A Full patrol must be conducted immediately after Site Lockdown each day to ensure the integrity of the outer perimeter. It is the responsibility of each guard to ensure the site is secure, it should not be relyed upon that the previous shift has undertaken a Full Patrol. A Full Patrol must be undertaken even when there has been no staff or visitors onsite since the last check. There are a number of reports that must be completed for varying circumstances. These can be viewed in the Security Logbook which are self explanatory and will be shown to you on your Site Familiarisation. Reports are a vital part of our role at the site, for which Securicore UK are measured upon. The recording of site incidents is a Key Performance Indicator which we use in order to measure the performance of each Guard. The Southbank has events on from Time to Time for which, Security staff are employed. Part of the Security Role is to provide assistance where necessary to the Security Staff in the event of a query or incident. Security staff must also ensure they sign in as with all visitors, if the are employed by Securicore UK, they must also sign the Security Logbook.